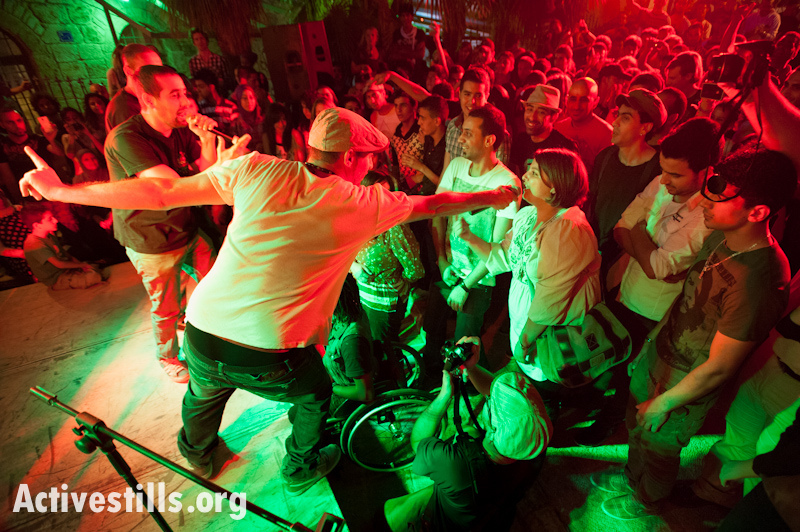 The final evening of the September Freedom Ride found us all gathered in the Old City of Beit Sahour to watch performances from DAM, Ministry of Dub-Key, Toot Ard, Palestine Street and the United Struggle Project. 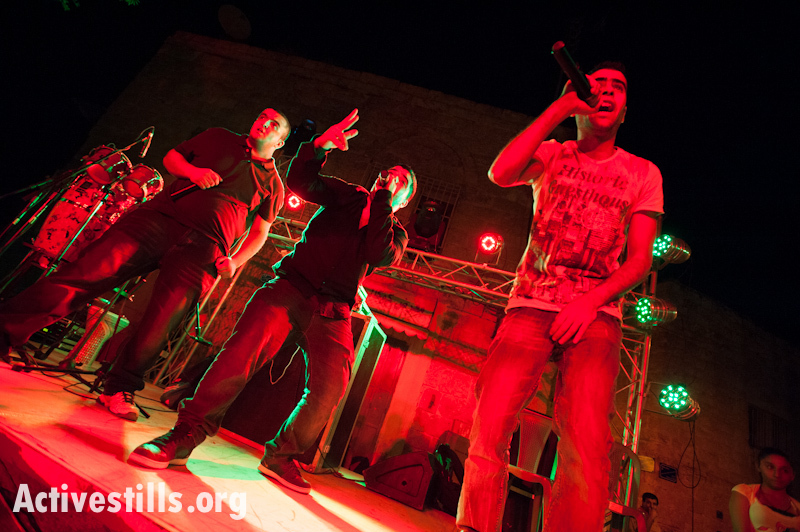 Against the background of beautiful, old Palestine houses, the sound of hip-hop and reggae echoed down narrow streets. 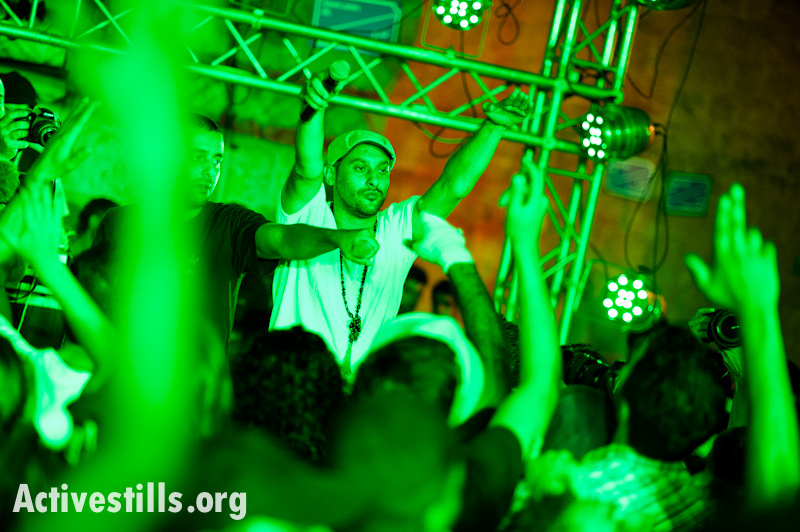 The energy of the crowd was raucous and ecstatic. The subject of resistance was, however, never far form anyone’s mind. 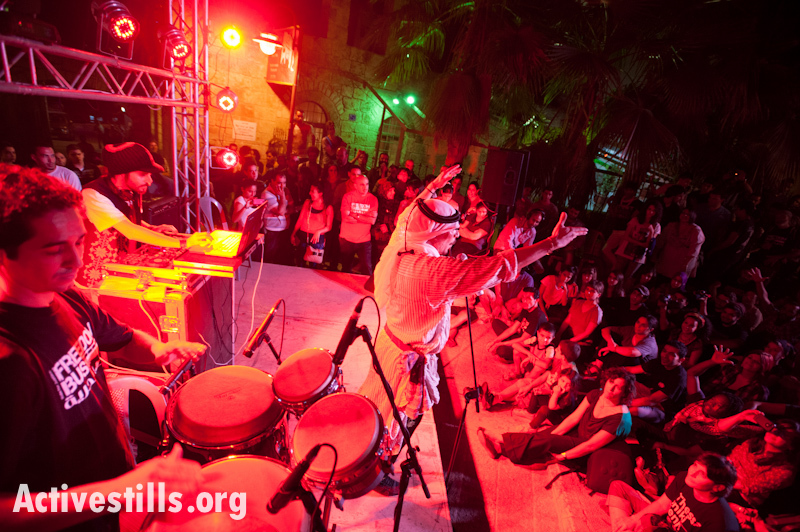 The songs of these Palestinian musicians might detail some of the sufferings of daily life, but they also encourage steadfastness and resistance to the occupation. Indeed, as we have discovered throughout the ride, the very act of creating art in such a situation -whether in the form of music, film, photography, poetry or theatre – is a form of rebellion in itself. Over and out Freedom Riders, see you next time! Day Eight: Stand with At-Tuwani! On the penultimate day of the September Freedom Ride, the Freedom Bus visited the small village of At-Tuwani in the South Hebron Hills. The village has a long history and archaeological investigation has uncovered evidence of Byzantine, Roman and Ottoman buildings in the village. 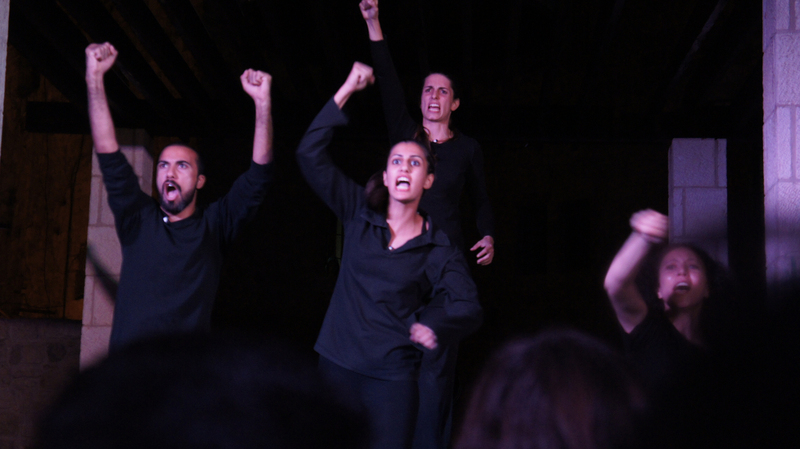 The actors of the Freedom Bus performed outside with a back drop of ancient olive trees. The audience were asked to share their stories, with a focus on experiences with settlers. A very old woman came forward to tell her story. 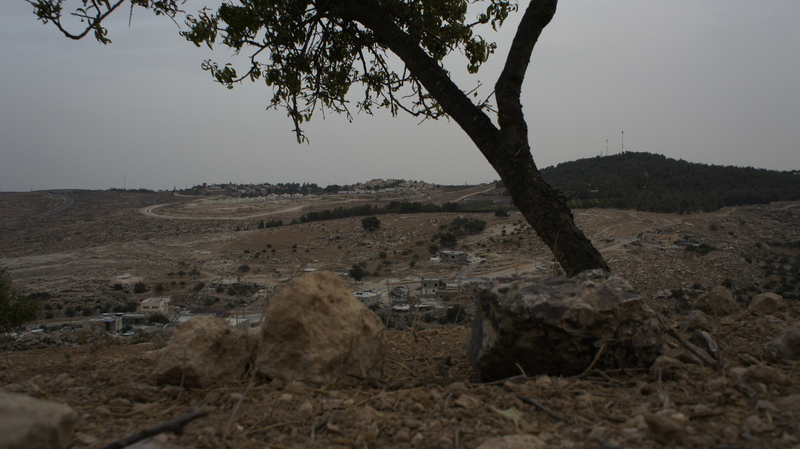 One day she was in the fields with her sheep when she was attacked by settlers and beaten. She screamed and screamed. People from the village came and started shouting, chanting and protesting. The settlers called the Israeli police. They came and started to arrest her son. At this point she became very angry and started shouting at the police. She took off her slipper and hit a policeman in the face! This story elicited great cheers from the crowd. A man came forward and told a story of an altercation with some settlers. He called the Israeli police to come and intervene. One policeman came. 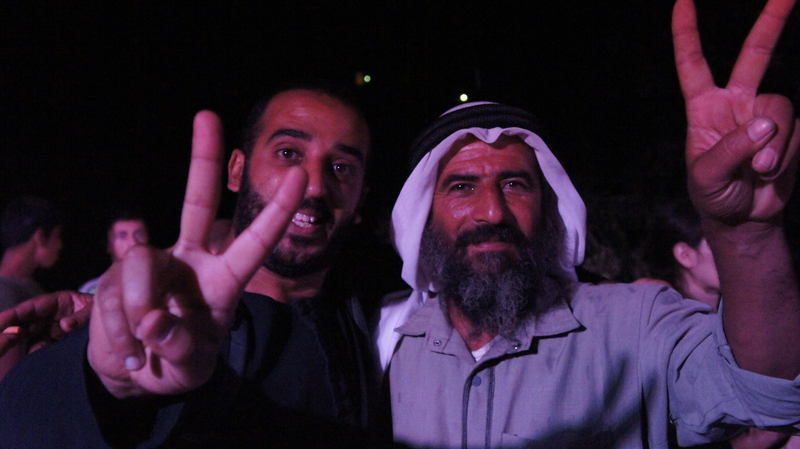 He stood near to the policeman so that we would be protected from the settlers, who fired shots in their direction. His mother was shot. They called for the ambulance but it did not come. He had to carry his mother to the hospital on the back of a donkey. Finally, an older man, a shepherd, told a story about settlers. He had wheels made for his car that were decorated with the colours of the Palestinian flag. A settler came and stole one of the wheels from his car. The entire village and people from the surrounding areas went to protest outside the settlement to demand the return of the stolen wheel.. The protest was mainly made up of children, because it just so happened that the wheel was stolen at the same time that a summer camp for the local Palestinian children being held. The army sent more soldiers than there were children protesting to police the demonstration. The soldiers told everyone to go home, promising that they would find the wheel and return it. The man (pictured above) said, “No! We will not go home until we get the wheel. And we will not go home until the settler who took the wheel returns it to us in person.” Eventually, the settler who had stolen the wheel came with his pick-up truck and gave the man a wheel. But it was different wheel, not the one with the Palestinian colours, but a new one that was better quality. Day Seven: Stand with Hebron! 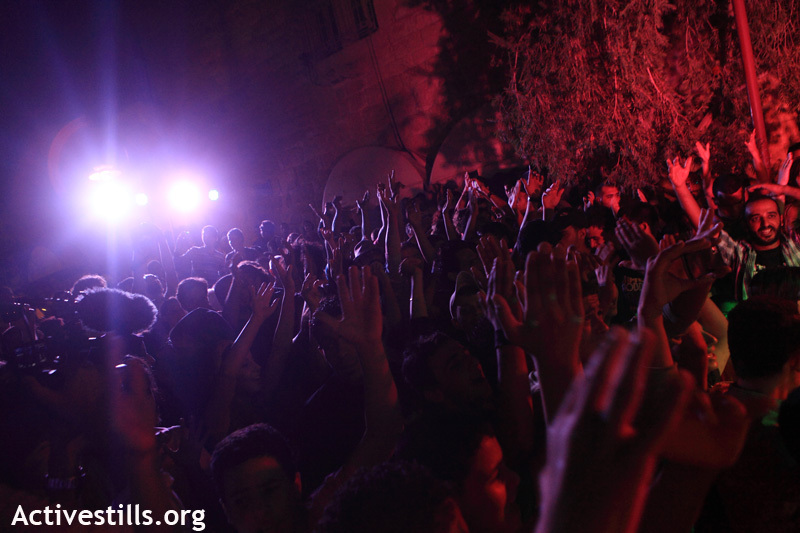 The actors of the Freedom Bus performed in the Friendship Garden in the centre of the Old City. From the rooftop of an adjacent building we could see a heavily armed Israeli outpost surveying the city. We could also see the lights of settler houses. Many of the houses in the Old City have been vacated. “Welcome to the ghost town,” one little boy said to us. An older woman called shared a story about harassment from the Israeli army. One day the army raided her house. It was very sudden, with no reason or warning. They searched the house violently, claiming there were looking for weapons. While they were searching they discovered a back door that provided another exit for the house. The soldiers demanded that they seal the door to stop access. They claimed the door was a security threat because it was near the Abraham Mosque. She refused. She said, “Show me the piece of paper that says I have to seal this door!” The soldiers forced the entire family into the street.While they were outside the family made fun of the soldiers, asking them to get them lemonade and popcorn from the nearby cafe. When they tried to arrest her twenty-year-old son, all the women made a little demonstration. They were shouting and made a circle around him so the soldiers could not reach him. In the end, they made it impossible for the soldiers and they gave up and did not arrest him.